1. Gypsum Board* — Outer layer of 5/8 in. thick gypsum wallboard. Inner layers of 5/8 in. thick wallboard. Wallboard installed without horizontal joints. 1 in. long self-drilling screws randomly spaced as required for support during installation of first layer of wallboard. CGC INC — Types C, IP-X1, IP-X2, IPC-AR, SCX, SHX, ULX, USGX, WRX. CERTAINTEED GYPSUM INC — Types FRPC, EGRG, GlasRoc, GlasRoc-2, Type C, 5/8" Easi-Lite Type X.
GEORGIA-PACIFIC GYPSUM L L C — Types 5, 6, 9, C, DAP, DD, DA, DAPC, DGG, DS, GPFS6, LS, TG-C, Type X, Veneer Plaster Base-Type X, Water Rated-Type X, Sheathing Type-X, Soffit-Type X, GreenGlass Type X, Type LWX, Veneer Plaster Base-Type LWX, Water Rated-Type LWX, Sheathing Type-LWX, Soffit-Type LWX, Type DGLW, Water Rated-Type DGLW, Sheathing Type- DGLW, Soffit-Type DGLW, Type LW2X, Veneer Plaster Base - Type LW2X, Water Rated - Type LW2X, Sheathing - Type LW2X, Soffit - Type LW2X, Type DGL2W, Water Rated - Type DGL2W, Sheathing - Type DGL2W. NATIONAL GYPSUM CO — Types FSK, FSW, FSW-3, FSW-6, FSW-8, FSL, and FSMR-C.
PABCO BUILDING PRODUCTS L L C, DBA PABCO GYPSUM — Types C, PG-C, PG-9, PG-11, PGS-WRS. UNITED STATES GYPSUM CO — Type C, IP-X1, IP-X2, IPC-AR, SCX, SGX, SHX, ULX, WRX, USGX, ULIX. USG MEXICO S A DE C V — Type C, IP-X1, IP-X2, IPC-AR, SCX, SHX, ULX, USGX, or WRX. 1A. Gypsum Board* — (As an alternate to Item 1) — Composite Gypsum Panel — Nominal 5/8 in. thick panels. 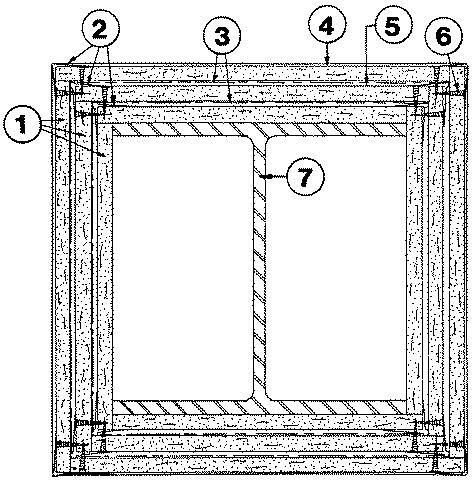 One of the three layers of Gypsum Board (Item 1) may be substituted with one layer of gypsum panel and secured as described in Item 1. 2. 28 MSG galv metal corner bead. 3. 18 SWG annealed wire, spaced 6 in. from each end and at 1 ft, 9 in. intervals. 4. Finishing system — Nom 3/32 in. thick gypsum veneer plaster may be applied to the entire surface of Classified veneer baseboard. Joints reinforced. 5. Laminated with joint cement. 6. 1 in. long self-drilling screws spaced 12 in. C. to C.
7. Steel Column — Min size of column, a W10 x 49, with outside dimensions of 10 x 10 in. with a flange thickness of 9/16 in., a web thickness of 5/16 in., and a cross-sectional area of 14.4 sq in.